For musicians on the go, the word "home" is relative — it's often wherever you lay your head at night. For musicians on the go, the word "home" is relative — it's often wherever you lay your head at night. We put this bundle together so that you have a recording rig you can use whenever and wherever inspiration strikes you. It works great in a traditional home recording setting, but it's also portable enough to take on the road. Add Apple's Camera Connection Kit (not included), and you can even record on your iPad®. This bundle is built around the Steinberg UR44 six-input, four-output interface. You connect your computer via USB, plug up your instruments, and bring the band. We supply the mics, headphones, cables, and accessories. Steinberg UR44 USB 2.0 recording interface — "You gain the flexibility of recording individual tracks or an entire band at once," Cory said. He pointed out that along with capturing vocals, you have the ability to record other instruments at the same time. 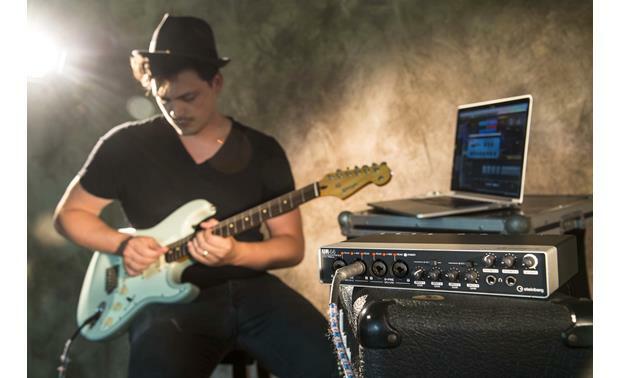 It has line-level instrument inputs and built-in DSP monitoring effects, so guitar players can plug directly in and get a real-time amp simulator with no latency. Cubase AI digital audio workstation (included with interface) — This software syncs up seamlessly with the UR44's built-in mixer. Then you can get to work right on your computer screen. That means spending less time with configuration and more time playing music and mixing. 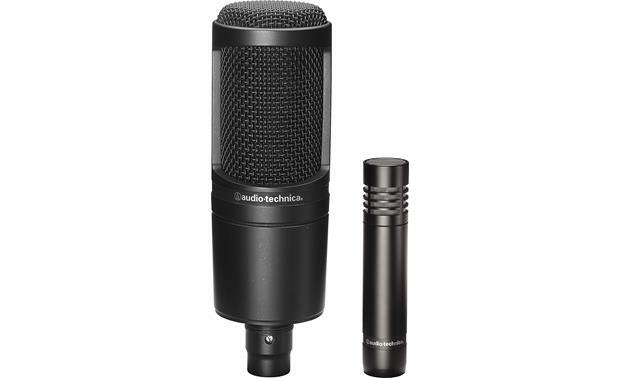 Audio-Technica microphone pair — The package includes a large diaphragm condenser mic for vocals and a compact condenser mic for recording instruments. Cory said that the UR44 gives you the ability to add more microphones later, if, for example, you ever want to mike a whole drum kit. Audio-Technica ATH-20x monitor headphones (two pair) — Get two discrete headphone mixes through these well-reviewed 'phones, tuned for balanced sound. Cory recently demoed the ATH-20x cans and raved about how comfortable they felt — precisely what you need for long recording sessions. Cory called this a "good stepping stone package" from simpler systems. He said musicians with recording experience will appreciate the extra inputs and outputs. But the software is easy to learn, so you don't have to be a master sound engineer to use it. All the components are pretty light, and easy to carry (especially if you pick up an ultra-rugged Gator case, sold separately). The interface even gives you the ability to integrate pre-recorded parts into a live performance. "You know," Cory said, "so the keyboard player doesn't have to be at every show." The Steinberg Home and Mobile Recording Bundle consists of the Steinberg UR44 audio interface with a pair of Audio-Technica condenser microphones and two pairs of ATH-M20x headphones. 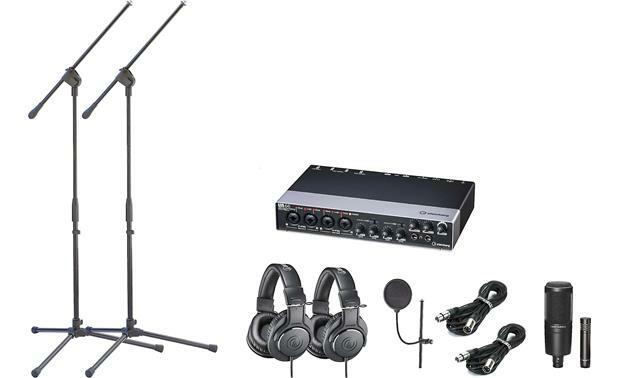 The bundle also includes two 10' Whirlwind mic cables / two Samson mic stands and a K&M pop filter (all individually packaged). USB/MIDI Interface: The UR44 is a powerful audio/MIDI interface designed to suit a huge range of recording and production situations. 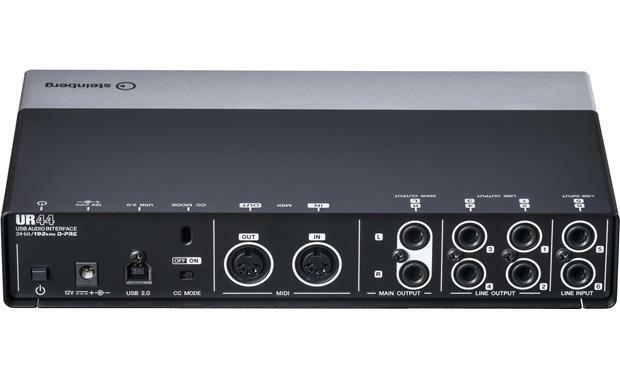 Four mic preamps, six inputs, four output channels, MIDI I/O ports, onboard DSP power and full iPad connectivity offer an outstandingly flexible feature set. Dimensions: Width 6.25", Height 1.8125", Depth 6.25". Rugged Chassis: Built to the most exacting standards by Yamaha's experienced engineers, the UR44's full-metal chassis is reassuringly solid. 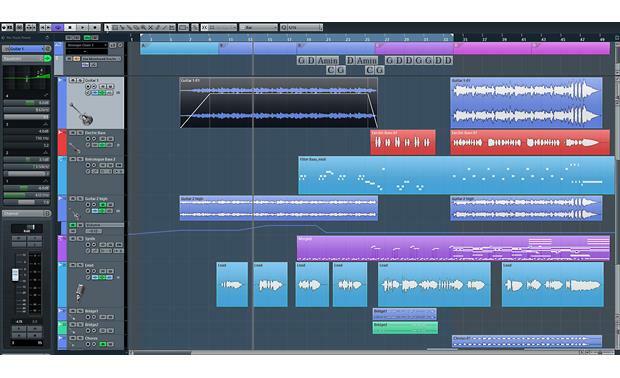 Cubase AI Included: Based on the same core technologies as the popular Cubase DAW, Cubase AI offers an intuitive feature set for composing, recording, editing and mixing. True Integrated Monitoring: When using Cubase, all the advanced monitoring capabilities are fully integrated into the application's GUI by True Integrated Monitoring technology. 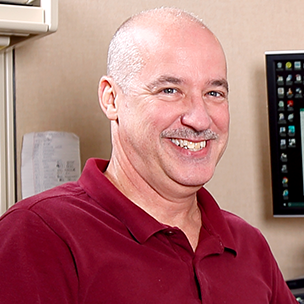 All aspects of I/O handling and DSP management are handled directly from within Cubase. Cubase automatically embeds your device into the Cubase production environment and manages all audio streams with perfect sync, allowing for a highly efficient workflow that boosts productivity to new levels. Plus, the URs feature direct integration into Cubase with dedicated windows and views that only appear when they are connected, providing full control of the hardware's functionality from within Cubase itself. Loopback Function: For easy live streaming of performances to the internet, the Loopback function consolidates all playback tracks and input channels and routes the mix to your internet streaming software. This function is often used by hosts of internet live streaming programs. When the function is active, incoming audio signals such as microphone, guitar or line source will be merged to the playback signal from an audio playback software like Cubase or other DAWs inside the computer. The merged signal will then be send back to the computer for streaming. Note: The UR44 is also compatible with all major audio editing, mastering, and music production software supporting ASIO, Core Audio, or WDM standard. iPad Connectivity + dspMixFx App: With the latest firmware updates, the UR44 introduces iPad connectivity (using Apple's iPad Camera Kit) and the free dspMixFx app alongside some other new features. Together with the UR44, the dspMixFx app allows you to utilize the benefits of Yamaha's custom-designed SSP2 DSP chip directly on your iPad. The dspMixFx app provides latency-free monitoring while running the highly acclaimed REV-X reverb, the Sweet Spot Morphing Channel Strip and Guitar Amp Classics with other iOS audio apps. Guitar Amp Classics: Guitar Amp Classics make extensive use of advanced Yamaha modeling technology. Four amp types with completely different sonic characteristics are provided, CLEAN, CRUNCH, DRIVE and LEAD. Best of all, you get a DSP-powered version and a VST 3 version of Guitar Amp Classics. So you can record the dry signal with your favorite amp sound without any latency using the DSP version. Once you're done, you can re-amp the recorded track with the VST 3 version. Sweet Spot Morphing: The Sweet Spot Morphing Channel Strip consists of a sidechain-enabled compressor and a three-band parametric equalizer. Both EQ and compressor were developed to attain a highly musical sound. Its featured morph knob smoothly allows you to morph through both EQ and compression settings in combination in order for you to come up with the ideal sound very quickly just by using one single control element. REV-X Reverb: The REV-X built into the UR44 is a complex reverb algorithm developed by Yamaha. Renowned for its high density, richly reverberant sound quality, with smooth attenuation, spread and depth that work together to enhance the original sound, the REV-X features three types of reverb effects: Hall, Room and Plate simulations with reverb time and level control. Applications: With its unique balance of portability and I/O capability, the UR44 may be among the most flexible devices of its kind available today. Four mic preamps, a total of six input channels, two headphone outputs, a MIDI port, iPad connectivity and four output channels mean that you're equipped to handle a huge range of recording and production scenarios - recording live performances, producing in studio quality at home or in a hotel room, pre-production for your next album in your rehearsal space, or playing back audio backing tracks on stage. All-Purpose Solution: Musicians today often find themselves in several different roles: today you might be recording your band in a rehearsal room, tomorrow helping out on a friend's album production or DJing at a live venue or club; the week after you might need an interface to playback audio backing tracks for a live gig or spend a Sunday afternoon finally getting around to setting up that home studio. Or you might need a portable interface for your hotel room to record that idea that's been bouncing around in your head all day while on tour. 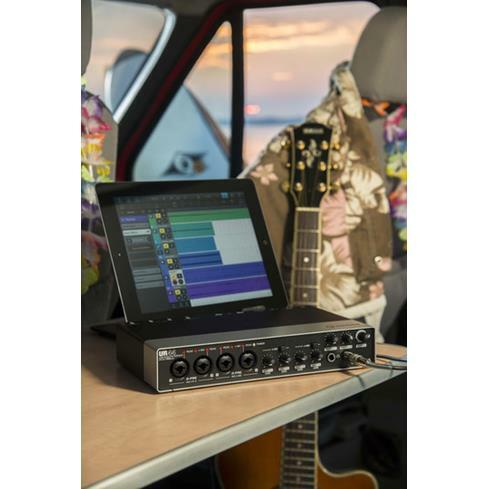 The perfect balance between I/O capability, portability, outstanding audio quality and seamless handling throughout makes the UR44 the ideal interface for the modern multi-role musician. Project Studios: While smaller project studios might not need a huge analog desk or dozens of inputs, they do require outstanding audio quality and the ability to record a wide range of musicians, vocalists and other audio sources. Phantom power for highest quality condenser mics is just as important as a feature as the ability to connect several pairs of monitors for A/B-ing mixes on different speaker combinations. Need to quickly record guitar to add to your score or song? Just plug in a guitar to a Hi-Z input and record your guitar with DSP FX and no latency. Record all your digital instruments and connect MIDI controller keyboards to completely integrate all your gear in one compact, portable interface. Live Bands: These days many bands and groups augment their live music with pre-produced backing tracks, perhaps even using MIDI to trigger additional equipment like stage lighting. The UR44 offers an ultra-flexible and reliable portable solution for bands and live musicians. Independent headphone outputs with individual volume control mean playback mixes are readily available for one band member in charge of cueing the next song, while four individual line outputs mean up to two separate stereo mixes for the FOH mixer and musicians on stage. The MIDI I/O can feed lighting equipment with MIDI events synced to the song playing back. And with ultra-stable drivers, a rugged metal case and a sturdy AC adapter that guarantees a stable electrical supply, the UR44 is ideally suited to live bands and performers. 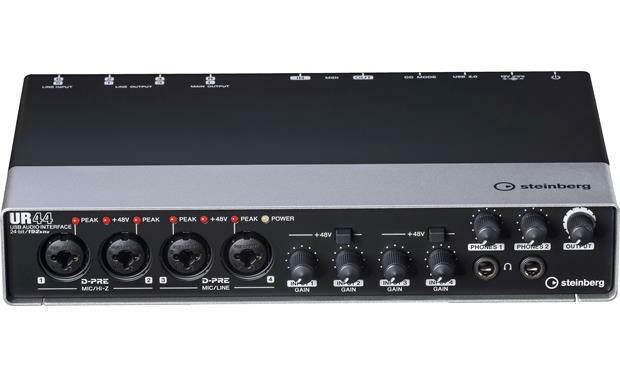 Mobile Recording: With its stable driver technology, quality components and four first-class mic preamps, the UR44 offers all the functionality needed to record live performances at smaller, more intimate venues or compact rehearsal rooms, or even to record larger groups or vocal ensembles with a few well-placed, high-quality mics. The combination of a portable interface that can fit in a shoulder bag with first-class hardware and software components like the acclaimed D-PRE mic preamps and the ultra-stable drivers makes the UR44 perfectly suited for many mobile recording. Note: Yamaha Steinberg USB Driver is a software program required when connecting the UR44 to a computer. Make sure to install it before initially using the device. Yamaha Steinberg USB Driver is a software program that allows communication between the device and a computer. 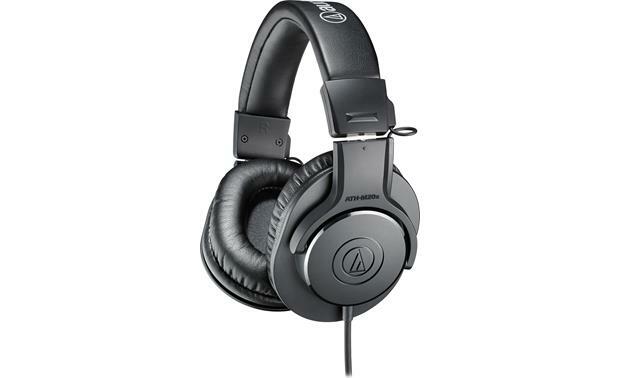 Overview: The Audio-Technica ATH-M20x Professional Monitor Headphones features a closed-back, over-the-ear design for excellent sound isolation in loud environments. The sturdy ATH-M20x is designed for use for studio or field recording. Drivers: The 40mm drivers are made with rare earth magnets and copper-clad aluminum wire voice coils, and are tuned for enhanced low frequency performance. Cable: The ATH-M20x has a single cable exit on the left ear cup. The attached straight cable is over 10 feet in length (123"), and terminated with a 3.5mm mini plug that can be used with most portable devices. A snap-on 1/4" (6.3mm) adapter is included for those times when you're listening to home or professional components with a full-sized headphone jack. Dimensions: Width 3.293", Height 4.011", Depth 1.81"
Samson Microphone Stand: Samson's MK-10 Professional Microphone Stand combines the crucial elements of lightweight durability with an attractive and functional design. This collapsible tripod boom stand folds up easily for transport anywhere you need it. It also features a roadworthy, steel-constructed design that offers superior resiliency with great flexibility of positioning. Its sleek black finish ensures an elegant, yet inconspicuous presence. K&M Pop Filter: The K&M Popkiller is a black, clamp-on microphone pop filter on a 13" long steel gooseneck. The filter has a double nylon screen with a black plastic frame. 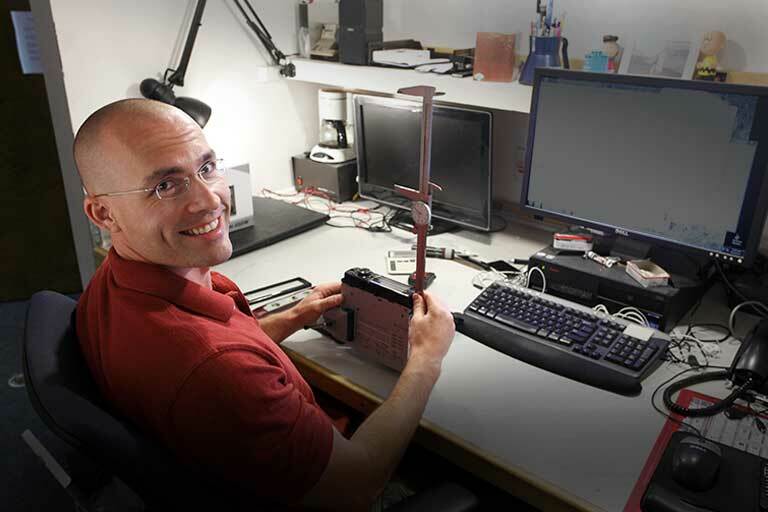 The clamp works with any microphone stand with a shaft diameter of up to 30mm (1-3/16). The locking screw has a plastic end to prevent scratching the stand. Whirlwind Connect Series: The Whirlwind MIC10 microphone cable is part of the MIC series that offers great value. The cable has a black PVC jacket with polyethylene insulation, and is terminated with male and female XLR connectors. It comes with a hook-and-loop cable tie to keep them neat for storage. These imported cables are available in four lengths: 3', 10', 25', and 50'. This cable is 10' in length.